In 1900 a group of sponge divers blown off course in the Mediterranean discovered an Ancient Greek shipwreck dating from around 70 BC. Lying unnoticed for months amongst their hard-won haul was what appeared to be a formless lump of corroded rock. It turned out to be the most stunning scientific artefact we have from antiquity. 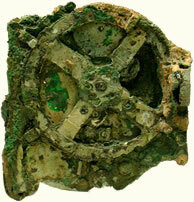 For more than a century this ‘Antikythera mechanism‘ puzzled academics. It was ancient clockwork, unmatched in complexity for 1000 years – but who could have made it, and what was it for? Now, more than 2000 years after the device was lost at sea, scientists have pieced together its intricate workings and revealed its secrets. 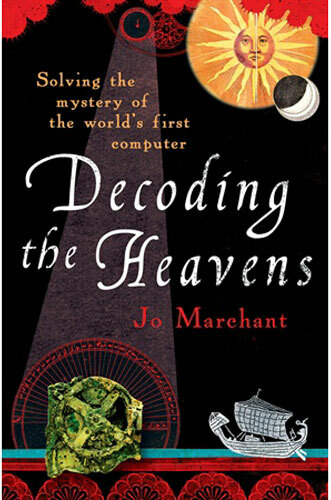 In Decoding the Heavens, Jo Marchant tells the full story of the 100-year quest to understand this ancient computer. Along the way she unearths a diverse cast of remarkable characters – ranging from Archimedes to Jacques Cousteau – and explores the deep roots of modern technology not only in ancient Greece but in the Islamic world and medieval Europe too. At heart an epic adventure story, this is a book that challenges our assumptions about technology transfer over the ages while giving us fresh insights into history itself. Did the Greeks’ vision of a geometrical universe come from the internal gearing of an ancient mechanism? For more information on Decoding the Heavens and the Antikythera mechanism as well as my old Decoding the Heavens blog, please click here: jomarchant.com/decodingtheheavens.com.